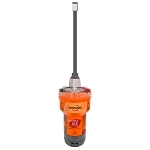 The McMurdo Smartfind S20 AIS MOB is designed to be fitted to a lifejacket using the clips supplied, ready to be activated in the event of a man overboard situation. 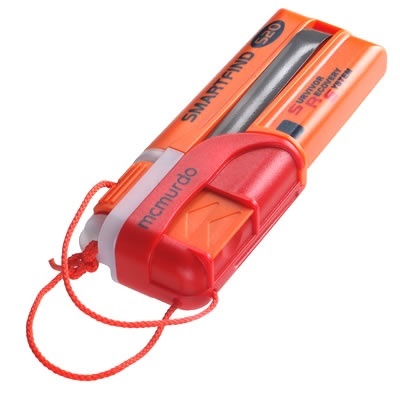 After the lifejacket is inflated, pull the orange locking tab downwards which allows the red cap to be released. Pulling off the red cap deploys the antenna and activates the S20 SRS. The S20 AIS MOB features a high precision GPS and it will transmit position information and a serialized identity number back to your vessel’s onboard plotter, enabling you to be quickly located and recovered. 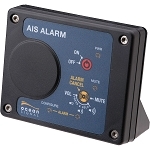 It will transmit continuously for a minimum of 24 hours and has a 7 year battery storage life. The flashing LED indicator light also makes you easier to spot at night. An automatic deployment option is offered when professionally fitted to compatible lifejackets, allowing the S20 to automatically activate when the lifejacket is inflated. 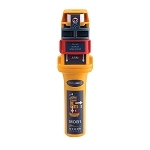 The Smartfind S20 SRS is designed to be used mounted on a lifejacket using the clips provided, prior to going to sea. When it is installed in the lifejacket the orange safety tab is released, which ‘arms’ the S20 ready for use. To use, first inflate the lifejacket. When it is inflated, pull the orange tab downwards to pull the red cap off the S20. This will deploy the antenna and automatically switch ON the S20 SRS.